First sighting: clicking into my Flipboard app this morning on my iPad and reading the latest Polka Dot Bride blog post. Miss Polka Dot has willingly shared Baroque Bistro’s recipe of their beautiful salted caramel macarons. I stare at the recipe and the photo takes me back to October 31, 2009 to be precise. The date of our Engagement party. Mr ELG and I had a “Party in the Park” at the Column gardens in Centennial Park in Sydney, Australia. The roses were in full bloom, the hedges freshly cut and the grass was soft and green. Mr ELG and I had just come back from a Paris trip where Laduree macarons were on our agenda each day. As Laduree has no Southern Hemisphere store, Baroque Bistro had the next best macarons (I prefer the delectable taste from the Rock’s Baroque kitchens over Zumbo any day but that’s my personal preference!) 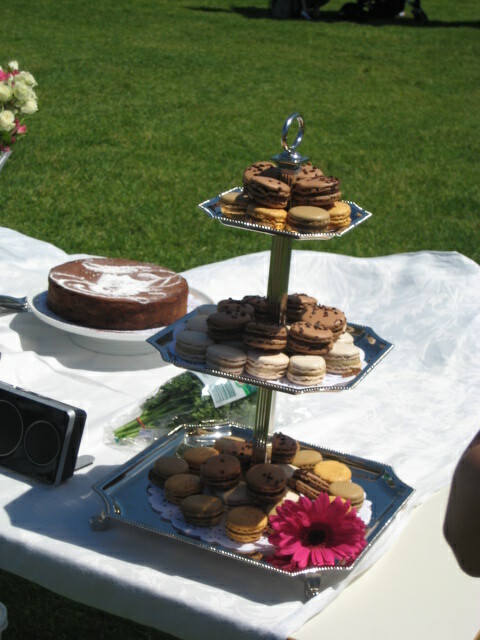 and if I recall correctly, I think I picked up 250 macarons that morning struggling to hold back from nibbling on a few. Salted Caramel was one of the flavours and take my word for it or get yourself down to Baroque Bistro today; the flavour combination is exquisite and as I write this post, know I am salivating! Second sighting: while MM is snoozing and I have a spare ten minutes between chores, I grab the latest edition of Delicious magazine; Issue 113 – March 2012. In their latest foodiefile. there’s a write up on the latest cafe on the Surry Hills scene; The Hills. As I scan the short paragraph, my eyes find their way to “salted caramel shake”. Ooooohh I think; can I get there today with MM in tow? A shake with THE marriage of flavours today of all days would go down so well, so smooth, so satisfying on this summer’s day. OH I MUST GO! If you need me, you know where I will be….happy Friday!